As a follow up to last year’s participation in the Flinders Street Station Design Competition, I am pleased to reveal the Red and Black Architecture Studio’s submission into the Lodge on the Lake Design Competition. 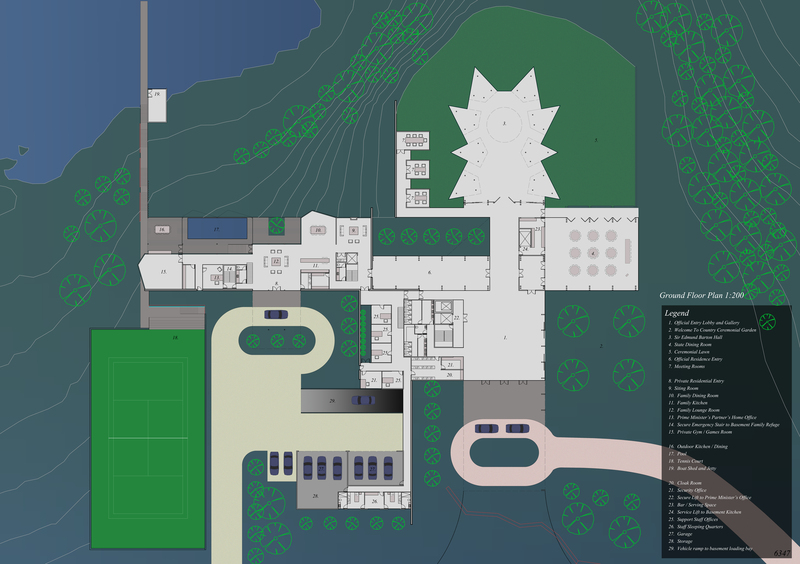 The opportunity to design a new official residence for the Prime Minister of Australia on the shores of Lake Burley Griffin in Canberra, was too good to refuse, despite my very limited available time. The brief itself was left quite open to interpretation, which allows the designer to play up or down any aspects as they saw fit. No doubt the intention behind the open brief open was to enable maximum design creativity on a project, which at this time, is purely hypothetical. Upon reflection of the brief and the design task before me several questions came to mind. How can the Architecture of the Prime minister’s official residence, embody and reinforce the ideals and expectations of the Australian Public? How can the lodge be a building for the Australian public, whilst still providing the vital security and privacy requirements for our nation’s leader? 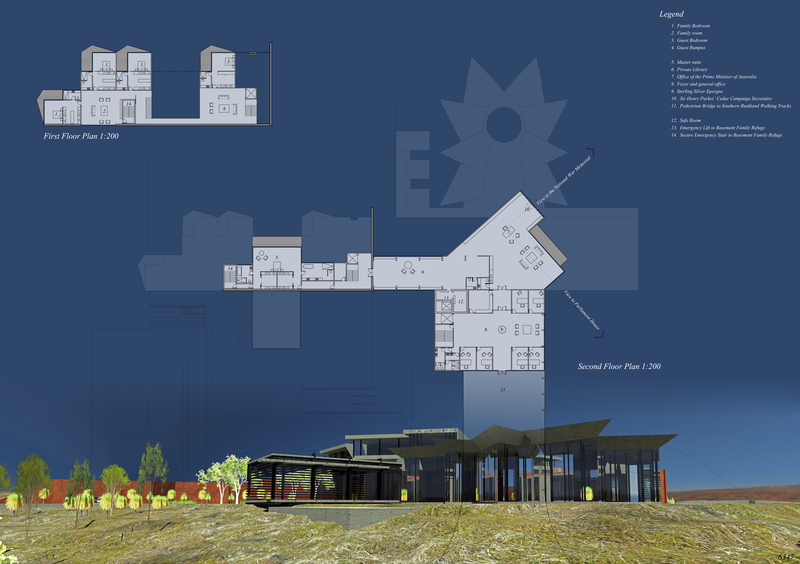 Could the Architecture of the Lodge reshape the idea of what it means to be Prime Minister? Or could it even enhance the performance of our nation’s leader? The answers to these questions arrived through the design process. By utilising clearly defined spatial planning separation of public from private was achieved without creating an enveloping and restrictive interior. The public spaces were located on the Eastern ground floor of the building, progressing along a North-South axis. These spaces culminate in a largely transparent grand hall with views over Lake Burley Griffin. Reference has been made to the states and territories whom the Prime Minister represents and to the Australian people to whom the building belongs. A glassed corridor leads from the public spaces to a monumental weathered steel wall which is the Australian equivalent of the 10 Downing Street public entry. On the other side of the door, the private residence enjoys both the privacy and security of the dividing wall and the amenity of the north facing views over the Lake. In keeping with Walter Burley Griffin’s extensive use of design axes, the Prime Minister’s office has been specifically oriented to have a relationship with Parliament House and the National War Memorial. These visual cues provide a backdrop against which decisions can be considered deeply and made with confidence. Welcome to The Lodge Prime Minister. This residence, nestled amongst native bushland, has been designed for the Australian people to embody the ideals and integrity that are expected of your Prime Ministership. The first spaces that you will encounter honour the contribution of the Indigenous Australians who are the traditional custodians of the land on which The Lodge is sited. The entry gallery features works by prominent Indigenous artists amongst other contemporary Australian pieces. The Welcome to Country Ceremonial Garden is adjacent to the gallery for formal state occasions. The centrepiece of The Lodge is the Sir Edmund Barton Hall, named for the first person in a long line of honourable Australians which you now continue. This hall can be used for functions, speeches and press conferences. As Prime Minister of Australia, Australians expect you to contribute your leadership beyond our shores, on the world Stage. The circular skylight in the centre symbolises the globe, and your obligation to make it a better place as a world leader, to seek peace and prosperity for all. The official entrance to your residence is made up of a dramatic glazed walkway leading to a solid rusted steel wall which separates your private residence from the public function areas. The residence is zoned over three levels, with primary living spaces on the ground floor, bedrooms for family and guests on the first floor and the master suite on the second floor. The private library sits between the master suite and your office. With northerly views across Lake Burley Griffin, it serves as a quiet retreat for contemplation and reading. From your office desk you will enjoy a direct view to the Australian Flag above Parliament House. This will serve as a constant reminder of your obligations to the parliament. The office has also been orientated to have an aspect toward the National War Memorial. This connection brings into the office an acknowledgment of the sacrifices made in the past and the gravity of decisions to be made for our future. 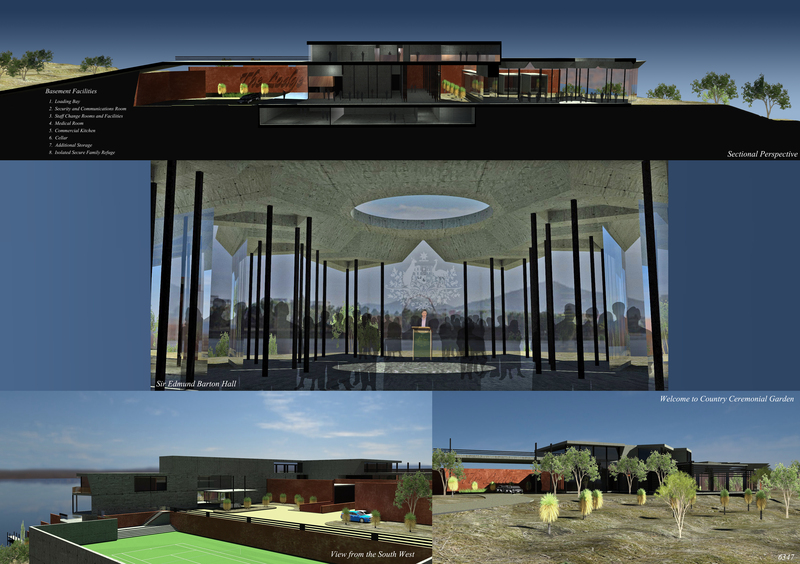 The design of The Lodge is transparent and open to represent Australian Democracy. The existing Lodge was built in 1927 and is nearing its use by date as the official residence for the Prime Minister. The Lodge requires ongoing substantial maintenance and is clearly not fit for the purpose required of it. In January the existing Lodge was condemned by the National Gallery of Australia director Ron Radford who aptly described the status quo as “an embarrassment”. I am not for a moment calling for the demolition of this historically significant structure. However the time has come to plan for a new Lodge which can be a source of national pride rather than embarrassment. This competition kick starts that discussion and places it on the national agenda. For more information about the competition visit the official competition website here. 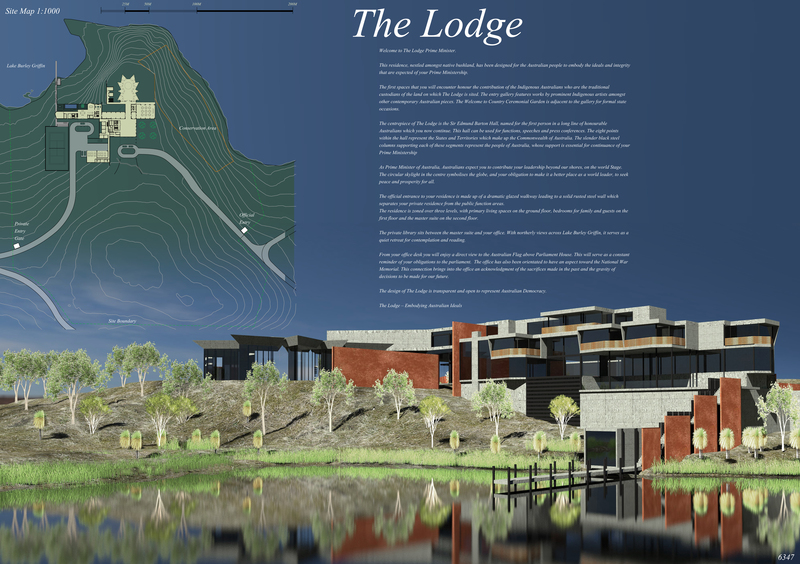 This entry was posted in all posts, The Lodge on the Lake Design Competition, Uncategorized and tagged The Lodge on the Lake Design Competition. Bookmark the permalink. Well done Michael. Very impressive.